One of the true joys of living in Tasmania is the raspberries. Sweet, tart, soft and juicy, for many of us they are the ultimate summer fruit! Now is the season for raspberries and you’ll see them for sale at roadside stalls, in good delis and grocers and at markets all over Tassie. If you are buying raspberries to make jam, sauce, ice-cream or syrup, you can often buy ‘jam raspberries’ sold in larger quantities, usually at a lower price. The Westerway Raspberry Farm (who were selling lovely berries at our last market) also have a farm gate shop in Westerway, which is definitely worth a visit, especially if you are heading towards Mt Field National Park. 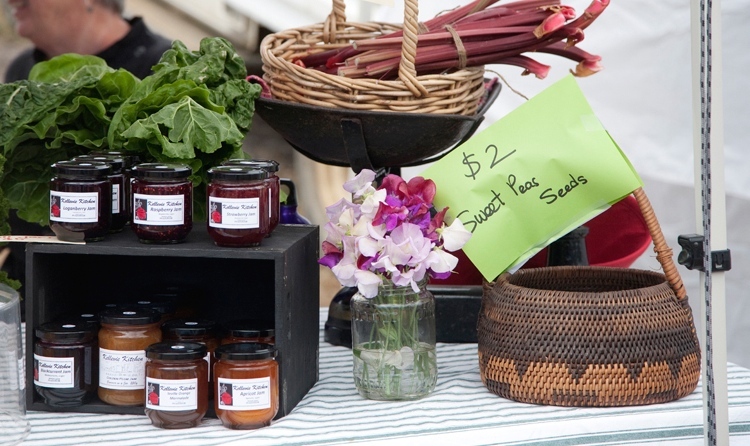 This recipe for Raspberry Jam comes from the Bream Creek Farmers Market Cook Book, and is from Gaye Wright, from the Tasman Gazette and Sorell Times. Make the most of fruit in season and enjoy beautiful, fresh raspberry jam for the rest of the year – a jar also makes a gorgeous gift. Remove the stems from the raspberries. Grate the lemons and apples, including the skin and the pips, and put in a heavy based pot, along with the raspberries. Bring the fruit to the boil with 2 cups of water and simmer until the fruit is cooked and soft. Using a stick mixer, puree the fruit and add the sugar. Bring the mixture back to the boil, reduce the heat and simmer until it reaches setting point. The setting point can be checked by placing a small dollop of jam on a saucer in the fridge. Once cool, the jam should be set. If not, more cooking is required. Carefully ladle into sterilised glass jars (this mixture will be very hot) and seal tightly. Glass jars used for bottling jam, chutney, sauce etc need to be sterilised before use, to avoid any harmful bacteria growing. To do so, preheat the oven to 120 degrees celcius. Wash the jars well in very hot, soapy water and rinse in hot water. Place the jars on a baking tray in the oven for 20 mins, remove and fill immediately with the hot jam. Do not put hot jam into cold jars or vice versa as the glass may shatter. Copies of the Bream Creek Farmers Market Cook Book are available at the Market on the Community Stall, from the Bangor Wine and Oyster Shed, Vines and Designs in Copping, The State Cinema Bookshop and may also be available at other local book shops.